We’ve updated our Guide to DIY Heart Rate Monitors (HRMs) & Handheld ECG Monitors (Part I) with new models of chest bands/wristwatches sets, Bluetooth versions and wearable technologies. A consumer heart rate monitor (HRM) is useful when Atrial Fibrillation patients want to monitor their heart rate and pulse when exercising or when performing physically demanding activities. “The Contec PM10 (about $79 on Amazon.com) is a very easy-to-use small 4 oz. unit that can track a single channel ECG waveform. 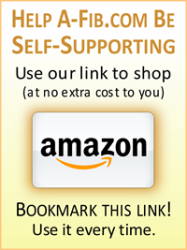 You can observe the scan live, then download the recordings (up to 30) to your computer or smartphone for review and print to share with your doctor.” Read the full review. “Wearable technology” offers a new option for those who find a chest strap uncomfortable or chafing. Instead of the chestband, these workout clothes have sensors built-in. Just snap on your heart rate sensor from your chestband. Starting at $75. The HRM sensors/monitors in our guide work by being in contact with the skin. Don’t confuse DIY/consumer heart rate monitors with fitness bands like Fitbit or running/sport watches. This group of fitness wristbands use an optical sensor to shine a light on your skin illuminating your capillaries to measure your pulse. Optical sensor wristbands are not accurate enough for A-Fib patients. For more, see my article: When Tracking Your Heart: Is a Wrist-Worn Heart Rate Monitor Just as Good as a Chest Strap Monitor? We’ve posted a new video with Dr. John Mandrola, MD, a cardiac electrophysiologist from Louisville, KY (Patti’s hometown). In this interview, Dr Mandrola talks about the impact of lifestyle factors on patients with atrial fibrillation. He explains how in the past 5–10 years doctors have started to understand that A-Fib can be caused through “upstream” factors that affect atrial health, things that stretch the atrium like high blood pressure, obesity, diabetes, even stress and anxiety, and over exercise like endurance exercise. Dr John Mandrola is the chief cardiology correspondent for Medscape—a web resource for health professionals (see ‘Trials and Fibrillations with Dr John Mandrola’). In addition, he maintains a general health and fitness blog, Dr John M, and is active on social media, especially Twitter, where he can be found @DrJohnM. We’ve added a new video to our Library of Videos & Animations. 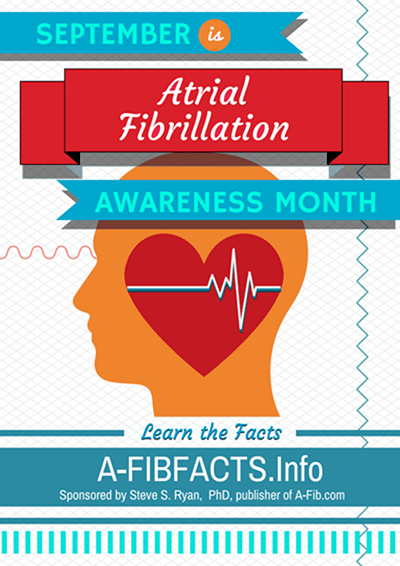 A graphic display of actual heart in Atrial Fibrillation. How it could look to your doctor on an EKG/ECG monitor; (Your EKG may look different, but will be fast and erratic). Includes display of the changing heartbeat rate in the lower left. For comparison, we’ve included a graphic comparing the tracing of a heart in normal sinus rhythm vs. a heart in A-Fib. A-Fib is fairly easy to diagnose using EKG. The ECG signal strip is a graphic tracing of the electrical activity of the heart. An electrocardiogram, ECG (EKG), is a test used to measure the rate and regularity of heartbeats. To learn more, see our article, Understanding the EKG Signal. Endoscopic video of a beating heart; shows placement of the Left Atrial Appendage into the jaws of the stapling device before amputation and removal (using a EZ45 linear stapler). With voice-over narration, (1:34 min.) Posted by BillSchnee. Animation from the National Heart Lung and Blood Institute. Your heart’s electrical system controls all the events that occur when your heart pumps blood. The electrical system also is called the cardiac conduction system. If you’ve ever seen the heart test called an EKG (electrocardiogram), you’ve seen a graphical picture of the heart’s electrical activity. A heartbeat is a complex series of events. These events take place inside and around your heart. A heartbeat is a single cycle in which your heart’s chambers relax and contract to pump blood. This cycle includes the opening and closing of the inlet and outlet valves of the right and left ventricles of your heart. Each heartbeat has two basic parts: diastole and systole. During diastole, the atria and ventricles of your heart relax and begin to fill with blood. At the end of diastole, your heart’s atria contract (atrial systole) and pump blood into the ventricles. The atria then begin to relax. Your heart’s ventricles then contract (ventricular systole), pumping blood out of your heart. Each beat of your heart is set in motion by an electrical signal from within your heart muscle. In a normal, healthy heart, each beat begins with a signal from the SA node. This is why the SA node sometimes is called your heart’s natural pacemaker. Your pulse, or heart rate, is the number of signals the SA node produces per minute. The signal is generated as the vena cavae fill your heart’s right atrium with blood from other parts of your body. The signal spreads across the cells of your heart’s right and left atria. This signal causes the atria to contract. This action pushes blood through the open valves from the atria into both ventricles. The signal arrives at the AV node near the ventricles. It slows for an instant to allow your heart’s right and left ventricles to fill with blood. The signal is released and moves along a pathway called the bundle of His, which is located in the walls of your heart’s ventricles. From the bundle of His, the signal fibers divide into left and right bundle branches through the Purkinje fibers. These fibers connect directly to the cells in the walls of your heart’s left and right ventricles (see yellow on the picture in the animation). The signal spreads across the cells of your ventricle walls, and both ventricles contract. However, this doesn’t happen at exactly the same moment. 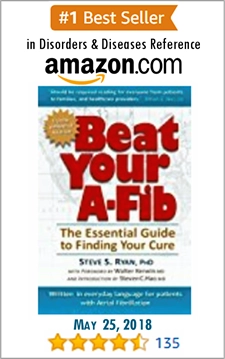 “I am 69 years old, in permanent A-Fib for 15 years, but non-symptomatic. My left atrium is over 55mm and several cardioversions have failed. My EP won’t even try a catheter ablation. I exercise regularly and have met some self-imposed extreme goals. What more can I do? My answer: As you may know, being in permanent (long-standing persistent) Atrial Fibrillation can cause other long term problems like fibrosis, increased risks of heart failure and dementia. So you are wise to be concerned. I’m not surprised your electrophysiologist (EP) is reluctant about performing a catheter ablation. Being asymptomatic with 15 years of long-standing persistent A-Fib and a Left Atrium diameter of 55mm, most EPs wouldn’t recommend or perform a catheter ablation on you. Have you tried the newer antiarrhythmic drug Tikosyn (generic name dofetilide)? 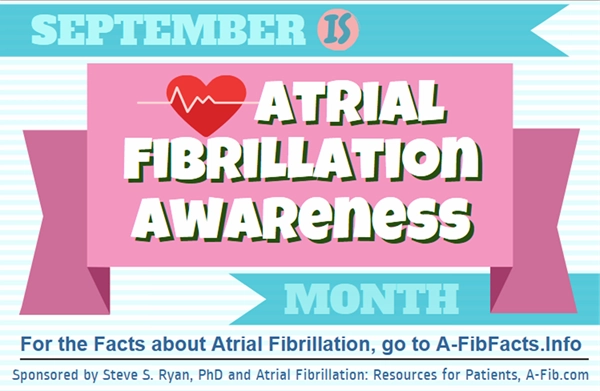 It’s a bad idea to just live with your Atrial Fibrillation. 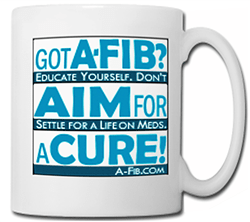 A-Fib is a progressive disease. It reduces the amount of blood flowing to the rest of your body by about 15%–30% with damaging effects. At the same time, your heart is working progressively harder and harder. I have paroxysmal A-Fib and would like to know your opinion on which procedure has the best cure rate. 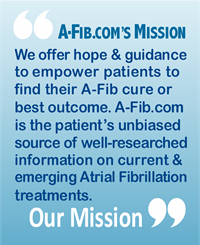 The best cure rate isn’t the only criteria you should consider when seeking your Atrial Fibrillation cure. Let me first review your top three procedure options: cardioversion, catheter ablation, and surgical Maze/Mini-Maze. Catheter Ablations: Radio-frequency and CryoBalloon catheter ablations have similar success rates 70%-85% for the first ablation, around 90% is you need a second ablation. How to achieve these high success rates? It’s crucial you choose the right electrophysiologist (EP)…Continue to read my full answer. Atrial Fibrillation doesn’t discriminate. Our Pinterest board has over 40 celebs who have dealt with A-Fib. You might be surprised to learn of the many celebrities with A-Fib. From the NBA, NFL, MLB, NHL to track & field athletes and Olympic champions. Political leaders and public servants to musicians, actors and performers. For example, ELLEN DEGENERES, Talk show host, comedian, KEVIN NEALON, comedian-actor-writer and Saturday Night Live alumni and HERB ALBERT (and the Tijuana Brass), the king of easy listening in the 1960s; Co-founder of A&M Records. BILLIE JEAN KING, Tennis legend (Wimbledon champ 20 times) and advocate for gender equality, MARIO LEMIEUX, Canadian American NHL/AHL Hockey Hall of Fame and LARRY BIRD, NBA star and coach. I’ve heard about ‘stiff heart’ or diastolic dysfunction. When you have A-Fib, do you automatically have diastolic heart failure? What exactly is diastolic dysfunction? 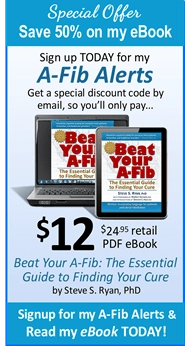 Someone with A-Fib can have much the same symptoms as someone with a ‘stiff heart’ or diastolic dysfunction. 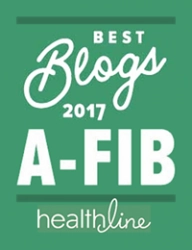 But A-Fib is an electrical problem that is often fixable, whereas diastolic dysfunction is a structural (or plumbing) problem usually not easily fixed.